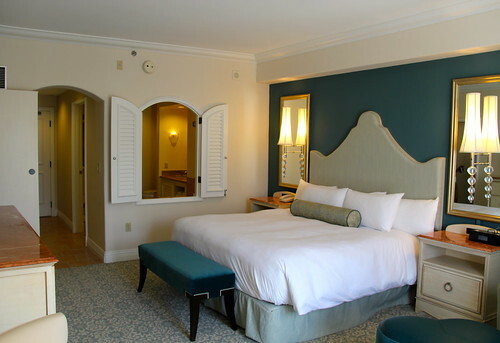 Welcome to Loews Portofino Bay Hotel at Universal Orlando Resort®! Celebrate la dolce vita – the sweet life – at Loews Portofino Bay Hotel at Universal Orlando. This luxurious hotel re-creates the charm and romance of the famed seaside village of Portofino, Italy, right down to the cobblestone streets and outdoor cafes. Hotel guests enjoy spacious guest rooms featuring authentic Italian furnishings, impeccable and attentive service, an opulent spa, three themed swimming pools, and exceptional dining. 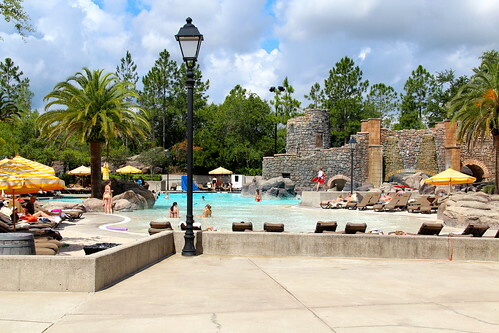 On-site hotel guests skip the regular lines all day at participating rides and attractions with FREE Universal Express Unlimited ride access in both Universal Orlando theme parks! Priority restaurant seating at select Universal Orlando restaurants. The standards for a standard room have just been raised. Equipped with either a king bed or two queen beds, our basic room is capable of sleeping up to five – 485 square feet. Immerse yourself in the surrounding European charm simply by looking out your window. Equipped with either a king bed or two queen beds, your room overlooks the piazza and Portofino’s scenic harbor – 485 square feet. These elegantly appointed accommodations feature an even larger living space, plus a separate tub and shower in a stylish and roomy bathroom. Equipped with either a king bed or two queen beds, additional amenities include VCP (video cassette player) and CD player. Enjoy a view of one of the pools and surrounding gardens – 525 square feet. Guests can now enjoy the very finest in European hospitality when they upgrade to the Club Level. In addition to a welcome amenity featuring a custom CD of classic Italian music and a nightly Portofino Bay themed turndown amenity, Club Level guests will be treated to an array of exclusive amenities in the new Portofino Club Lounge, where they’ll enjoy daily continental breakfast, evening hot and cold hors d’oeuvres, beer and wine service, nightly desserts including cookies and milk and more. This suite is single entry and is equipped with a Bay View room for the adults plus a separate room for the kids. Kids rooms are decorated in fun themes and include two twin beds or bunk beds, small table and chairs, separate closet, television, VCP (video cassette player) and CD player. 650 – 675 sq ft.
Bask in glorious comfort and spacious accommodations in one of three different style suites. 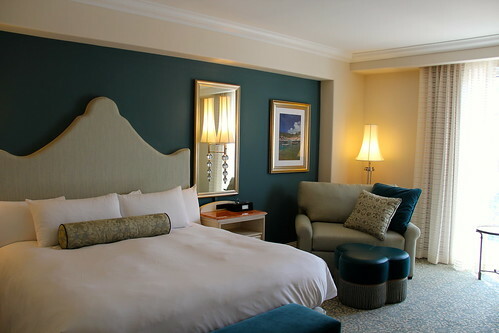 Each suite consists of a parlor connected to a standard bedroom, with either 2 queen beds or a king bed. All suites have 2 full bathrooms, 2 two televisions and pullout double sofa. Bice Ristorante – (pronounced Bee-chay) Your “Italian Fine Dining Experience.” Since 1926, Bice’s reputation throughout the world for outstanding food and superb service precedes itself. All dishes are freshly prepared, including handmade pasta, delicious entree and handmade pasta and desserts. Mama Della’s Ristorante – At Mama’s everyone is family! Here in Mama’s living room you’ll enjoy abundant portions of authentic Old World favorites from the Tuscany, Naples and Piemonte regions. Trattoria del Porto® – Serving breakfast, lunch and dinner, families will enjoy friendly service, diverse regional offerings, and plentiful buffets. Character dining available on select evenings. 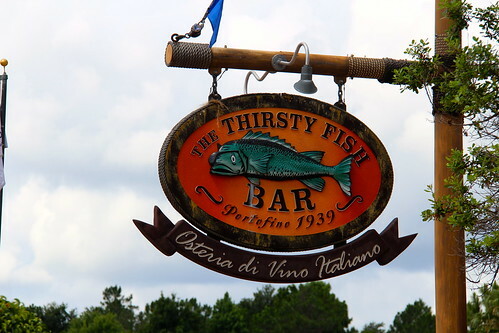 The Thirsty Fish® – This casual dockside bar is perfect for viewing the sunset from the piazza. It’s the ideal place to relax with family or friends. Bar American – This lobby lounge is the epitome of elegance. Savor exquisite appetizers while you sample your favorite beverage. Gelateria – Café Espresso – Tempting biscotti, homemade gelato, and luscious pastries are a few of the items offered. Sip a cappuccino and relax on the piazza. Sal’s Market Deli – A sensational assortment of Italian meats, cheeses, antipasto and salads are just part of what Sal’s has to offer. Splendido Pizzeria – What would Portofino be without an authentic pizzeria! Located poolside, Splendido Pizzeria serves everything from burgers to salads.